In any lathe, a cylindrical workpiece is turned at rapid speed while a fixed cutter is positioned to cut the material. This is why lathe work is often referred to as turning. This is in contrast to a mill, in which both the turret holding the tool and the bed on which the workpiece rests both move independently. There is no rotation in milling. 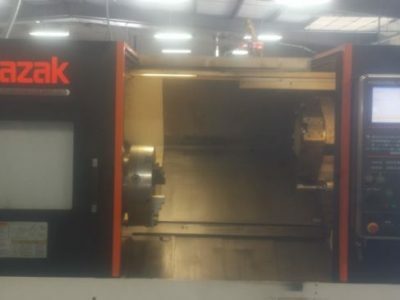 For those shops that have larger production runs to fill, and that require a high degree of accuracy and repeatability with the minimum investment of time and labor, CNC lathes are ideal. 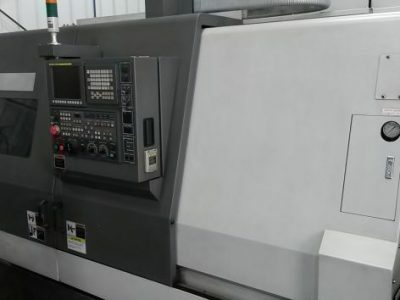 With a large indexing table full of different, already-mounted cutting tools and the ability to pre-program and store their paths of motion on the computer, CNC lathes require much less operator oversight than engine lathes--with a greater amount of accuracy. 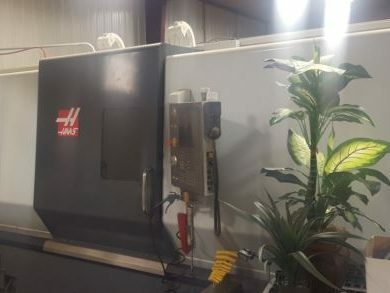 With advances in lathe technology many shops are also beginning to use CNC lathes for finishing jobs that would previously have been done on cylindrical grinders. For answers to your questions or more information on CNC lathes call Liberty at 847-276-2761 or send us an email sales@libertymachinery.com. 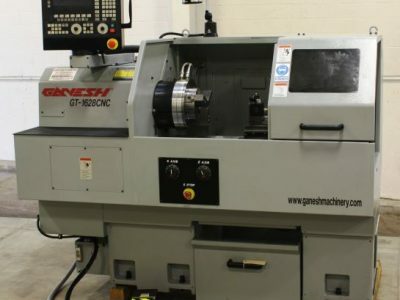 Liberty Machinery buys and sells all types of CNC lathes. 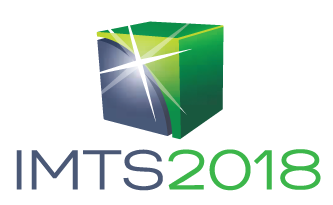 We are your trusted source for a high quality CNC lathe or turning center. 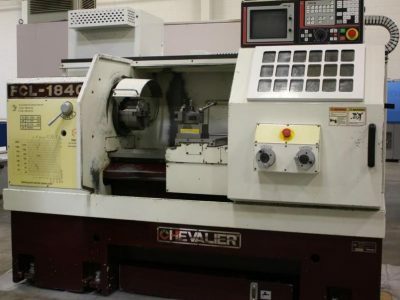 A CNC lathe performs the same work as a traditional engine lathe. Engine lathes do not excel at high-production jobs, and they are labor-intensive to set up, tool, and operate. 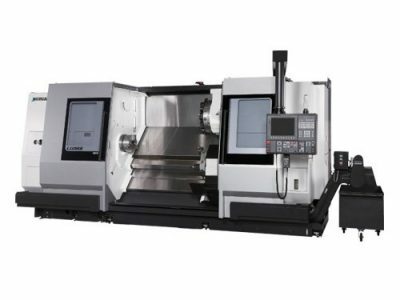 For high-production jobs, CNC lathes are far faster and more accurate due to the aid of the computerized controls and an indexable turret of tools. Just like an engine lathe, a CNC lathe consists of a headstock, tailstock, spindle, centers, chuck, and tool turret. Unlike engine lathes, CNC machines also include a control panel and are enclosed for added safety. They permit the addition of chip conveyors and automatic bar feeders for increased productivity. The workpiece is clamped by the chuck and held firmly. The tailstock moves in and the centers hold the workpiece from either end. The headstock houses the turning spindle which in turn causes the chuck and workpiece to rotate at a high rate. The tool turret can then be moved into the desired position. As the cutting tool comes into contact with the workpiece, it begins to remove chips which, because of the rapid rotation, results in an even cut around the entire diameter of the workpiece. 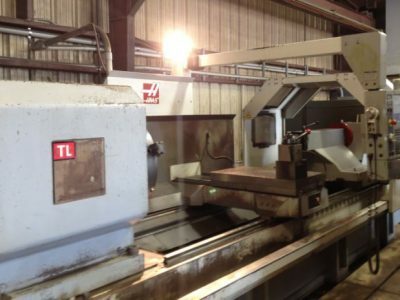 Liberty is always looking for used CNC lathes and turning centers to buy for inventory. Contact us and let us know what you have for sale. We’ll be happy to give you a free quote. 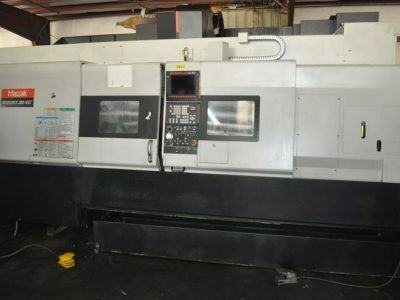 See our used CNC lathes for sale.